App-based jobs are becoming controversial in the People’s Republic, too. Factory strikes may be waning, but reports of worker protests involving startups like Meituan and Didi are rising. That’s leaving Beijing stuck between two priorities: social stability and tech innovation. 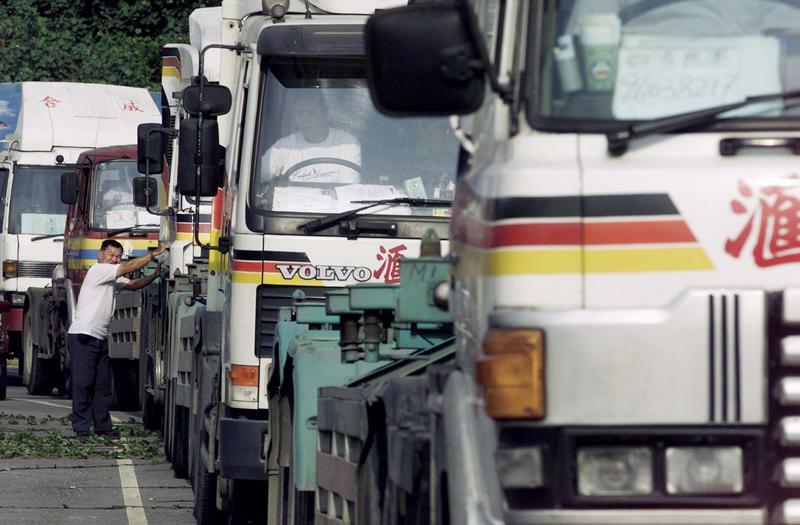 Trucks line up as 100 drivers protest outside a Hong Kong container terminal against a handling charge imposed by barge operators November 6, 2001. The barge operators, who handled about 30 percent of the 18 million containers shipped through the territory last year, are charging truckers a HK$40 ($5) fee per container. The dispute has added to the uncertainties hanging over Hong Kong as the world's busiest port. Chinese truck drivers have launched protests in at least a dozen locations around the country since June 8, demonstrating against low haulage fees and rising fuel costs, according to China Labour Bulletin, a Hong Kong-based organisation that tracks labour action in the mainland. Drivers blamed declining rates on the dominance of truck hiring firm Manbang, which allows companies to connect directly with truck drivers through an app. The company said in April that 5.2 million of China’s 7 million freight trucks were members of the Full Truck Alliance Group, its formal name. Manbang was formed in a merger of two logistics platforms, Yunmanman and Huochebang.